As a convenience, you may pre-register a credit card on the submission page to charge your purchases at event Nacho Average Parish Auction 2019. 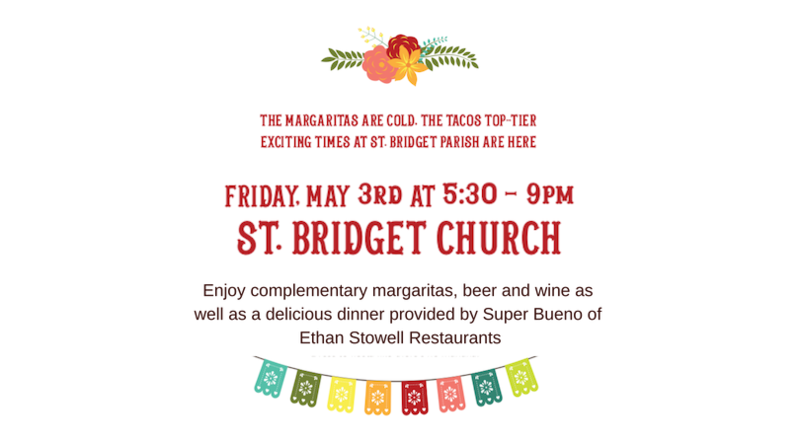 I authorize St. Bridget Church to use the credit card entered on the submission page at event Nacho Average Parish Auction 2019. Once the transaction has completed successfully, a confirmation receipt will be sent to the email address entered. - Fun, Games, Raffles, Sign-up Parties and a Live Auction. - Margaritas, Beer and Wine during cocktail hour with passed hors d'oeuvres. - A delicious seated Mexican dinner with beer and wine during the live auction. - Food provided by Super Bueno of Ethan Stowell Restaurants. - Volunteers: We need volunteers in many capacities. Email Susie Lane - susielane@comcast.net. - Gift Card Donations: We need restaurant or retail gift cards in any amount for game prizes. They may be purchased through ASB scrip or directly from retailer. May be left in the parish office. - Wine Donations: We are accepting wine donations valued at $25 and above for the wine toss game. Wine may be left at the parish office. - Cash works well, too! Donations can be made on this page, just to the left! Or checks may be dropped off in the auction basket in the parish office. Traditional Mexican and/or Dressy Casual - Let's Fiesta!